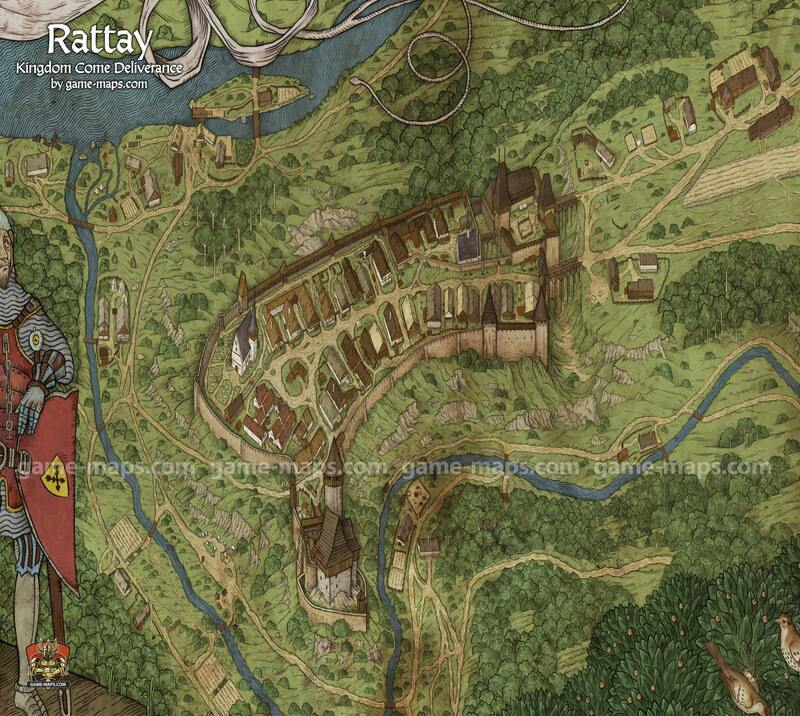 Map of Rattay in Kingdom Come Deliverance KCD Video Game. A small market-town with two castles – the upper castle, known simply as Rattay Castle; and the lower castle, known as Pirkstein or Pirkenstein (Pirkštejn, Pirkenštejn). The oldest written record of Rattay dates back to the 13th century when it was the property of Přibyslav of Rattay (mentioned in records in 1263 and 1289). At about the same time, ownership of Rattay passed to Burgrave Hroznata of Úžice, whose sons held several other castles and villages in the surrounding area. In 1293, King Wenceslaus II gave Rattay to Bishop Tobias (Tobiáš) of Bechyně. Then it became the property of Burgrave Hynek of Dubá who was the heir to the house of the Lords of Leipa (Lipá). Rattay experienced their greatest renown and prosperity under the administration of Henry of Leipa (died 1329), his sons and grandchildren. His son John (died 1338) was the most politically active. The municipality was also governed by Henry’s relatives, the Lords of Pirkstein, Ješek and Hanuš. Under their administration, the two castles were built, as were the churches, and the village was given strong fortifications. The lower castle in Rattay, founded by Henry of Leipa before the mid-14th century (first mention dates from 1346), spreads over an island in the the middle of the Živý Stream. The castle is separated from the town by a moat. This is a bergfried type castle with a massive tower, rounded corners in the rear and three rooms on each floor. The entire structure is surrounded by ramparts. In 1447 the castle unfortunately burned and then quickly changed owners. It suffered even greater damage during the peasant uprising in 1627. One hundred years later, from 1713–1724 it was rebuilt by Octavian Kinský into a presbytery and bell tower. The upper castle was built at the same time as the lower castle in the mid-14th century. It also burned in the same year as Pirkstein (1447). In the 16th century it was rebuilt into a Renaissance chateau and in 1672 renovated in the Baroque style. Today it houses the local town hall. The lower Rattay church was built in the 1460s by Ješek Ptáček of Pirkstein with his wife Anna. The church served as a presbytery along with the Church of St. Nicholas which no longer exists. From 1675–1691 it was demolished and rebuilt in the Baroque style according to the plans of Ondřej de Guarde. It has survived in this form to the present day with just a few minor changes. The only remnants of the original church are the tombs of the estate owners, for example a tombstone with the coat of arms of the Lords of Leipa mounted into the cemetery wall, and the base of the baptismal font from 1421. The first church was probably single-bay. Probably the older of the two churches within the castle walls. The first mention dates from 1343. It was located in the upper part of Rattay before the upper wall and partially served as a presbytery. Since 1336 the Korečník Mill has also belonged to the Rattay presbytery.